What is All In all about? All In is a state of mind, a level of commitment, and a way of being. I am all in when it comes to my clients: I am 100% committed to their growth and thriving. I work with clients who are willing to go all in. They need to be 100% dedicated to their own growth and process if my support is to provide value. "Vulnerability is not knowing victory or defeat, it's understanding the necessity of both; it's engaging. It's being all in...We must dare to show up and let ourselves be seen. This is vulnerability. 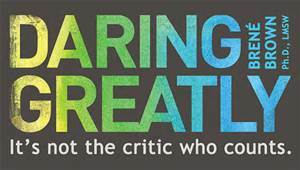 This is Daring Greatly." I invite you to ask yourself where in your life are you not daring greatly? What one change can you make today to demonstrate your commitment to being all in?